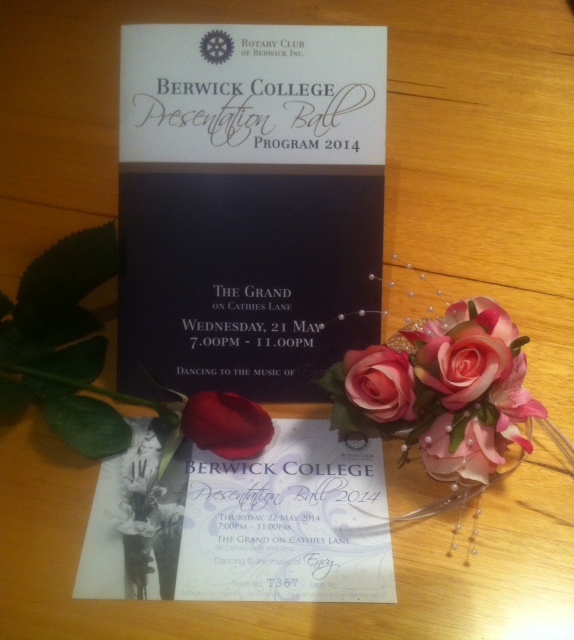 For many years the Rotary Club of Berwick has conducted the Presentation Balls for the Berwick College in May. An assembly of all Year 10 students is held in November, to brief prospective Debutants and Partners about the Presentation Balls by the Rotary Club of Berwick Coordinators and the dance teachers. This assembly is used to stimulate and inform the students about the importance of this event and enlightens them on dances that they will perform. This is followed by an information kit that is handed out to students in December, which advises costs, practice times, suit hire for partners, video, meals, ticket sales, rehearsals, etc. The students will attend nine practice sessions consisting of an hour each week, beginning in March; followed by a rehearsal at the venue prior to the glittering event(s). The tuition from the dance teachers is inspirational and every participant is made feel at ease during training. The transition of the students from knowing little about dancing to performing competently is amazing. As the date for the Balls approaches, the excitement begins to gather momentum and this is not only for the participants; for the parents and families too! The Debutants and Partners begin to arrive at the venue in the late afternoon, many in stretched limousines. They emerge from the vehicles, the Debs in their beautiful gowns and the Partners, immaculate in their suits; and make their way into the ballroom. After another short dance practice, the Debs are given their corsage and the Partners have the buttonhole flower pinned on their suit lapels. We are now ready for group photographs, followed by many more with Debs and Partners. The Debutants and Partners are then ushered away to a special area whilst the parents, families and friends are seated for the evening. The stage is set, the ballroom looks magnificent and the Debutants and Partners are introduced and presented to the receiving dignitary and to their families. The dancing is fantastic, beaming smiles from the participants, pride and tears of joy from parents, many more photographs and videos are taken and the glittering event continues as everyone enjoys a sumptuous meal. At the end of the evening, fantastic memories of a fabulous event are etched in the minds of all who attend and in particularly the Debutants and Partners; who will remember this night for the rest of their lives. Presentation Balls are glittering events, proudly coordinated each year for the Berwick College by the Rotary Club of Berwick. Coordinators take time to explain to students the pride and sense of achievement that flows from participation in the Balls; identifying an opportunity of a lifetime, accepting the challenge of learning new skills, making a commitment to one another, bringing enormous pride to their families and friends and importantly, becoming great ambassadors for the Berwick College and the community in general. Our Rotarians experience great satisfaction in organising an event that means so much for students, Berwick College and our community. Two glittering Presentation Balls were held for Berwick College on the nights of May 17th and 18th 2017 respectively; with nearly1000 guests (including 48 Debutants and Partners) attending. Each ball was enjoyed by all who attended on the night and judging by the way parents and guests responded by dancing with the Debs and Partners; everyone had a fabulous time! The Rotary Club of Berwick is proud to be able to continue the wonderful relationship that has been forged with the Berwick College over many years and donated a cheque this year for $12,000. Feedback received from Berwick College, parents and participants has been very positive and the Presentation Balls will be held again in 2018.